New York: The Armchair Detective, 1989. 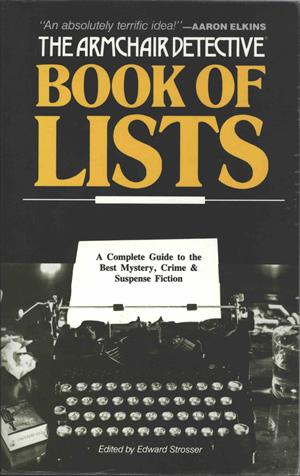 The Armchair Detective Book of Lists, edited by Edward Strosser, contains Tony Hillerman's list of his ten favorite mystery novels on page 222 as one of the Famous Mystery Writers' Ten Favorite Mystery Books lists. It was published in New York by The Armchair Detective in 1989. The top half of the front cover displays "The Armchair Detective" printed in white, and "Book of Lists" printed in yellow above a white rule, on a black background. The lower half is a backlit black and white photograph of an early model manual typewriter with a pack of Chesterfield cigarettes to the left and a highball glass partially filled with liquid to the right. The back cover is black with the book's title and description of contents printed in white and yellow. The publisher's information, cover credits, and book price are at the bottom of the back cover. The inside front and back covers are blank. Binding: Two-color paper covers. The book's title is printed in yellow on black on the spine.